Crocheting food is my jam – it’s one of my very favorite things to make! 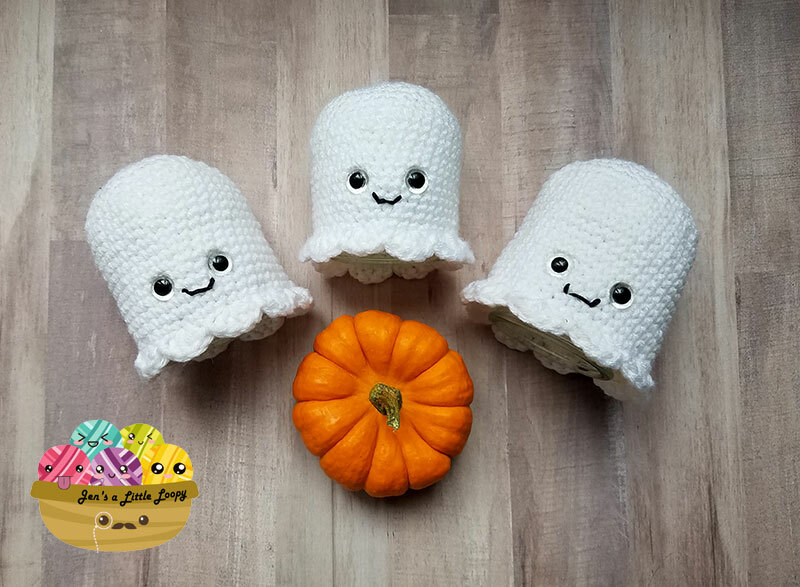 I don’t have a lot of crochet time anymore, so bite-sized, portable projects that can be worked in small bits of time (usually during my lunch break) are perfect! I used to have a peanut butter and jelly problem. For years I literally could not go to bed without having a peanut butter and jelly sandwich before I tucked in for the night. Weird, right? I say jelly, but really the proper thing to put on a sandwich with peanut butter is jam. Jelly is weird and jiggly and doesn’t spread evenly without smooshing the bread. It could be the bread but…I don’t want to work that hard for a delicious sandwich, so jam it is. 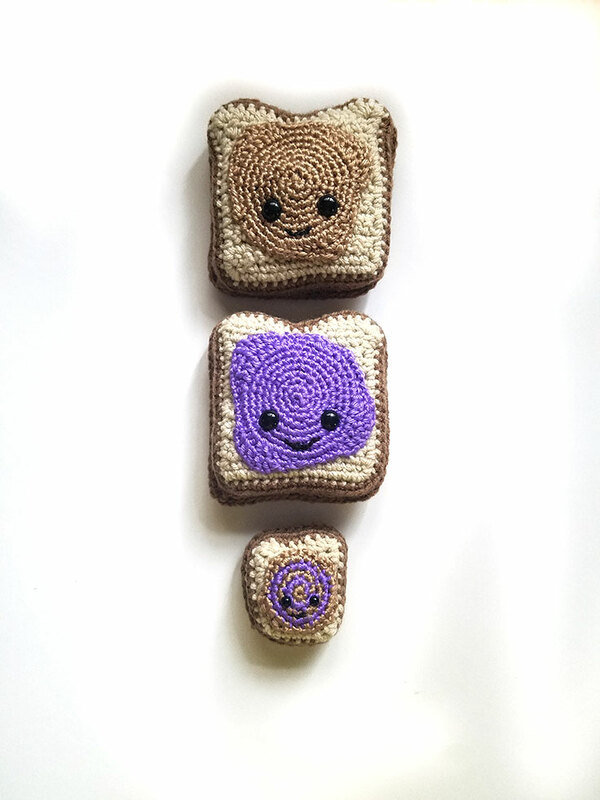 No matter what you put on your sandwich, PB&J is adorable when deconstructed into a Peanut Butter and Jelly crochet family! I made a pattern for you so you can have one of your very own! 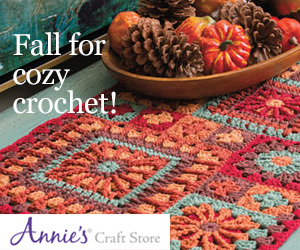 This pattern is perfect for beginner level crocheters! The bread pieces are worked flat and then joined together by the crust. 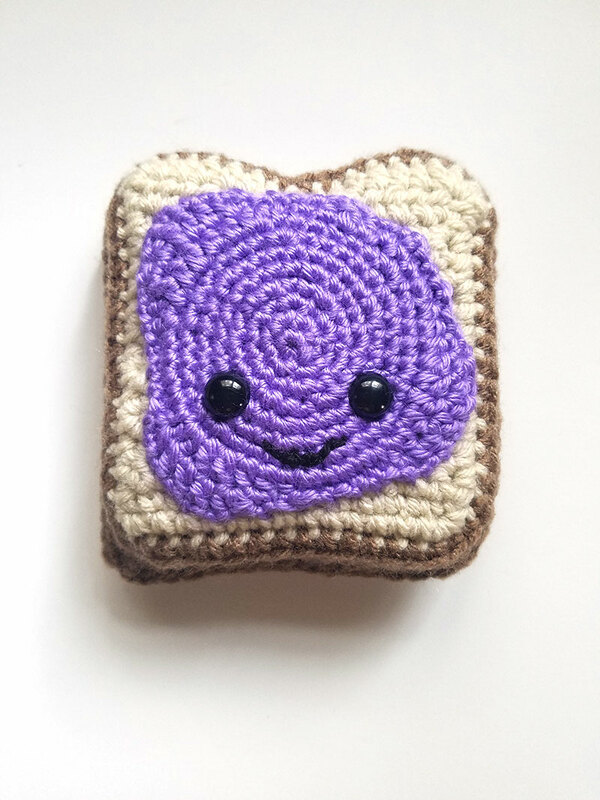 Before joining the bread pieces, you’ll crochet the peanut butter and jelly pieces and stitch them on. The big bread pieces are about 4 inches square, and the little bread piece is 2 inches. 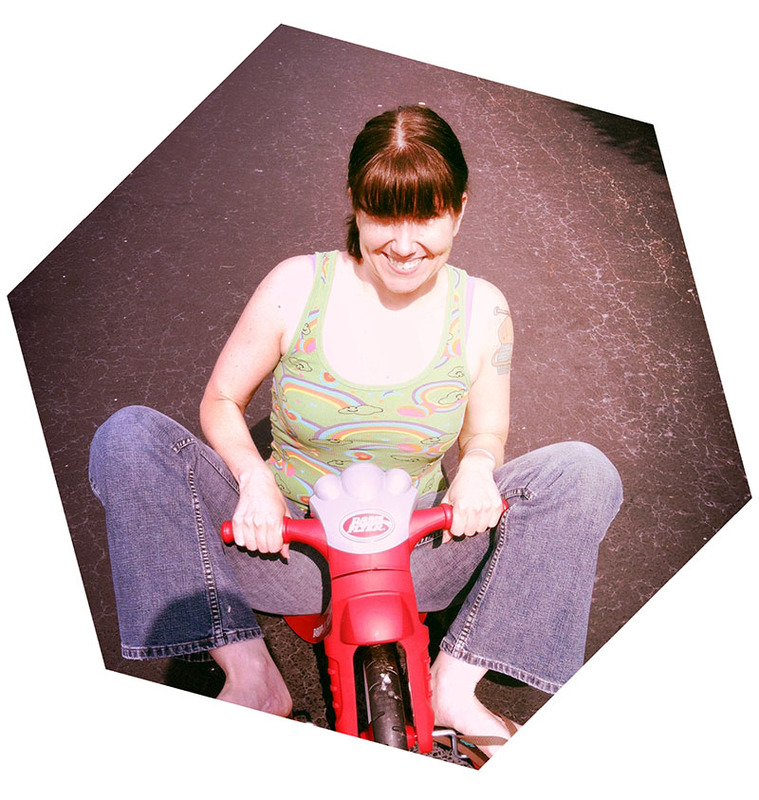 You could have a family done in a couple of hours depending on how quickly you hook! 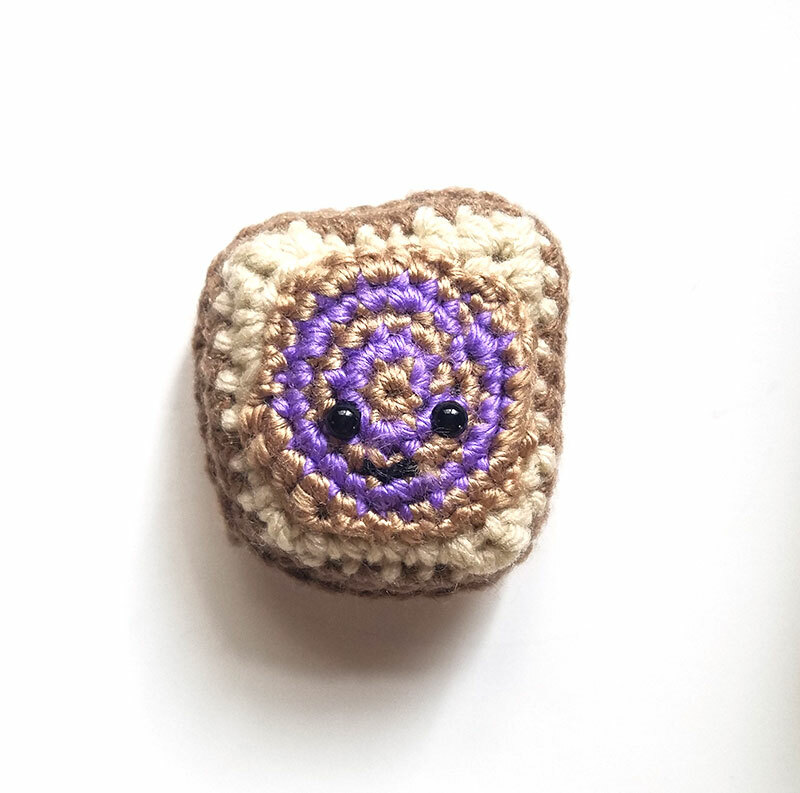 Time to assemble the Peanut Butter and Jelly Crochet Family! Insert your safety eyes into the peanut butter and jelly spread pieces as shown in the photos. You may wish to (carefully!) trim the back posts of the safety eyes with wire nips or sharp scissors, but you don’t have to. Stitch on the smiles with embroidery floss. Stitch the peanut butter and jelly spreads to the top bread piece (doesn’t matter which piece you call the top, I just picked the sides that looked the best!). When you get about ¾ of the way around the spread, tuck a small bit of stuffing under the spread. 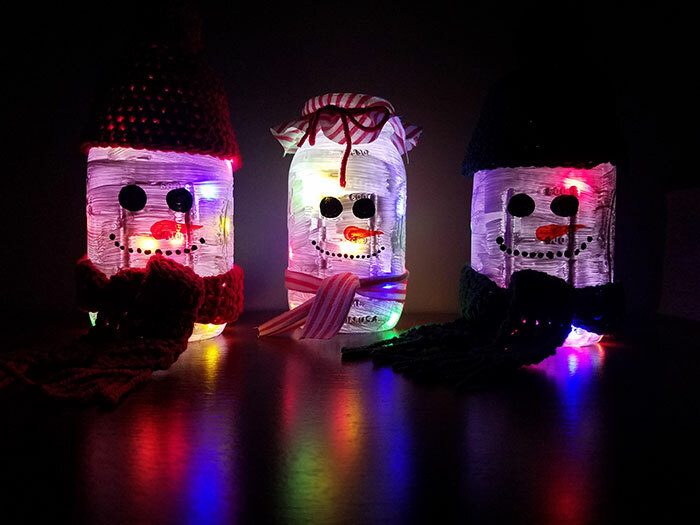 This makes it look a little extra 3D and super cute! 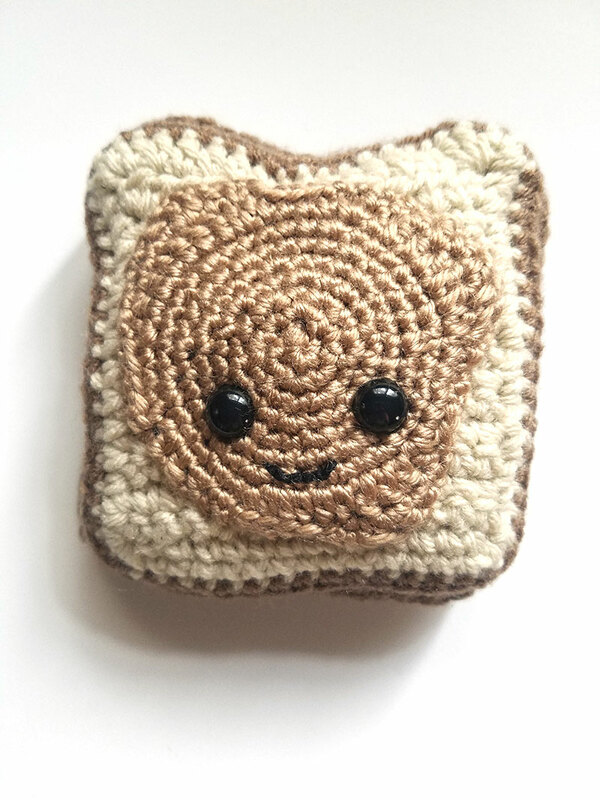 Now it’s time to crochet the bread pieces together by making the crust! 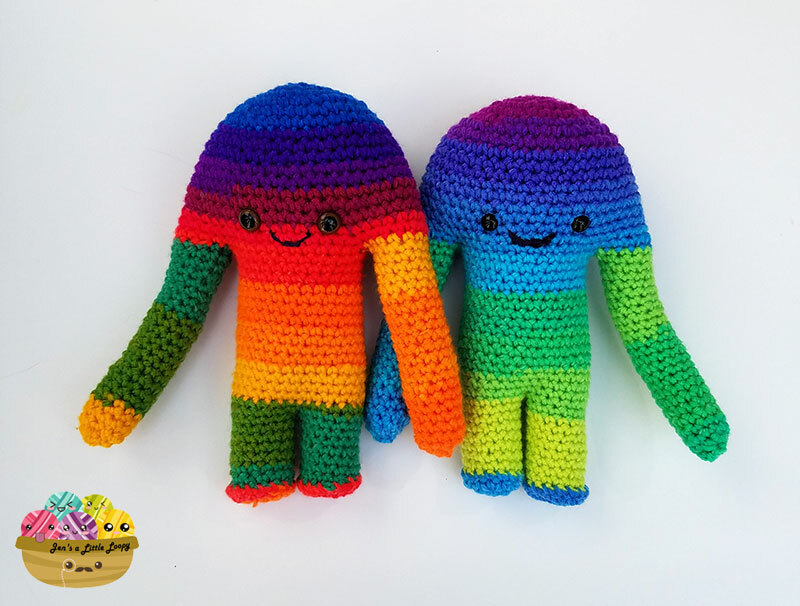 Enjoy your Peanut Butter and Jelly Crochet Family! If you liked this pattern, I would be grateful if you pinned and shared it!